A tour to discover Santenay through the remnants of its past. Don'miss : listed church of Saint Jean de Narosse, old dolomie quarries, Mont de Sène and orientation tables with viewpoint ; castle of Philippe le Hardi ; Casino des Sources. Start: Santenay: 18 km south-west of Beaune via the N74 and the D974. Parking: between the entrance to the Avenue des Sources camping ground in Santenay and the Casino (the Casino and camping ground are signed from the centre of the town). Distance: about 11 km; can be shortened by going down by GR® 7: length reduced to about 7 km in this case. Markers: directional posts and paint marks on various objects (walls, trees, ground etc). Restrictions: TAKE CARE during the hunting season (September till end-February) and official culls. In such cases, ideally take the shortcut. - Looking at the panel of footpaths in Pays Beaunois 1 2, turn right on the road up to Santenay-le-Haut. - In 100 m, pass in front of the Casino 3. - At the junction, take the crossing left to cross the D113 and go up Rue de Narosse. 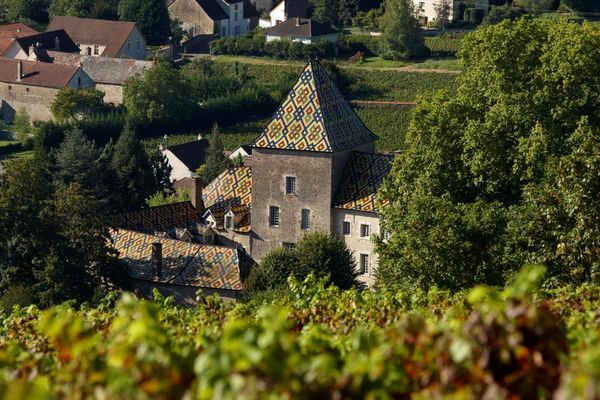 - At the junction, in front of a house with a "Burgundy" roof with glazed tiles and along a wall mural, turn left into Rue de la Charière. - In about 50 m 4, turn right into Rue de Foulot. Continue up the road, now metalled, along the stream (Terron Reu) 5. On the left, above the cliffs, the Three Crosses are visible. Off the circuit (not marked): take the 2nd road on the left: round-trip of 150 m to see the Church of St Jean de Narosse 6. 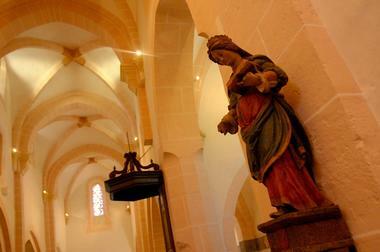 - Take the 1st road on the left, which then turns left (at the bend, nice view of the Church) and overlooks the vineyards 7. The slope becomes more sustained. - At the first vineyard on the right, at the crossroads (post P68), leave circuit 27 as it descends to the left and continue straight up ahead. - Ignoring a path coming in from the left, continue up between the fences. When Nolay is visible 8, take a right on a rising path (red and yellow markings). 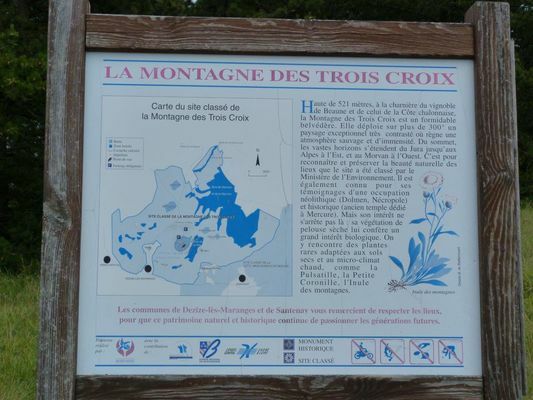 At the corner of the pine wood, turn right on a track up to 9 the Three Crosses (521 m) or Mont de Sène by steps to the top. Check out the 2 orientation tables to scan around the horizon. At post P83, go down among the boxwood on the GRP marked in red and yellow, then turn left on the tarmac road. - At post P58, turn right. Continue for 100 m and turn right again (post P102) to reach the small pass (post P59). 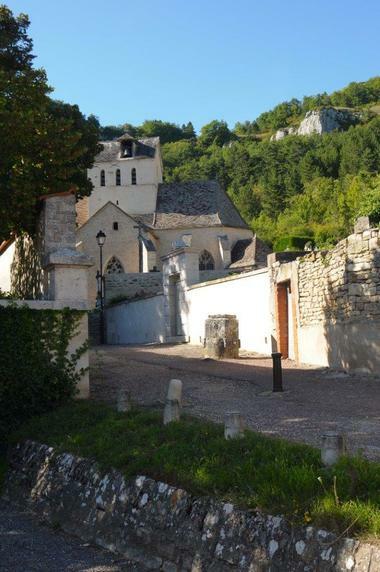 Continue straight on down a small path on the hillside, overlooking the Church of Saint Jean de Narosse. The path then becomes more steep-sided, carved into the rock (slippery when wet). - At the fork (sign P31), leave the GR® as it descends to the right. 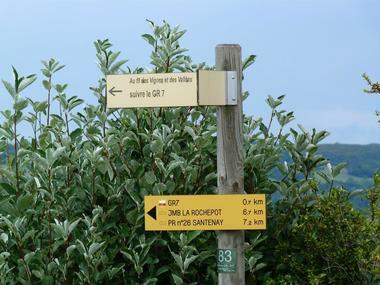 Off the circuit: you can take a shortcut to return to Santenay le Haut and the end of the circuit by the GR 7®. Head up left on a narrow path, which is fairly steep. - Arriving at the plateau, turn right and walk along an old dolomite quarry 11. - The path then turns slightly to the right to exit the quarry, then left and rises slightly. - On reaching a wider path, turn right. - In approximately 300 m on the left are the remains of a building for loading dolomite. - The path then goes on across large limestone slabs (slippery when wet), slightly downhill. Ignore all paths and cuttings on both sides. - At the fork, turn right. Ignore a path on the left. - Pass once again over limestone slabs. - At the fork, go straight on. - At the next crossroads, turn right and then, in about 100 m, right again. At post P32 12, ignore the tarmac road to the right and take, in front, past a rock, the grassy path descending through the boxwood. - Reach a wider metalled road and continue downhill. - Ignore two paths on the left and then one on the right. Continue to descend. - In about 100 m from the last junction, when Santenay becomes visible, leave the main road and take a little path to the right in the middle of boxwood. 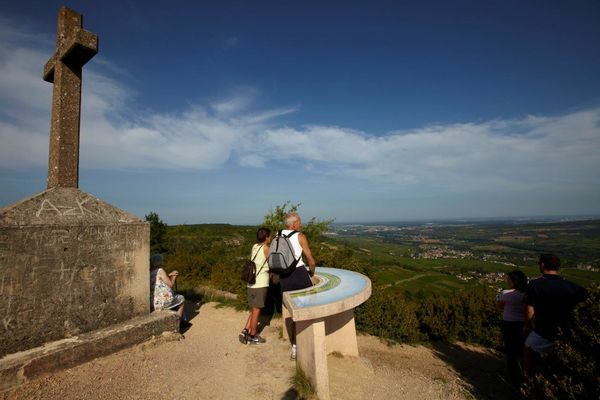 In about 5 m, cross a large road and then continue on the grassy path overlooking a vineyard. The path becomes wider, still grassy 13. Continue to descend. The path comes out on a small tarmac road which you follow straight on. - At the crossroads, turn right on Rue du Château. Pass the château. - At the crossroads, continue straight ahead on Chemin des Grands Murs. - Ignore a metalled road on the left and continue up the small tarmac route. - At the crossroads, go straight on. Continue along the tarmac road between two walls. - Then take a left on Rue de la Crée. - In 100 m, post 33, by an old wine press, turn right, past a building, on a gravel path which becomes grassy. Reaching the road, turn left, cross the road (D113) and take Avenue des Sources back to the car park.